A new member sent me a great question about how they just purchased their first gun and were trying to decide on what type of holster to buy and how to carry it. With the Christmas season here, I imagine there will be lots more folks who will be getting new guns and might have the same question. The thing is, there are so many options out there when it comes to buying a holster for your gun, so today I’m going to share with you what I recommend and the ways I personally carry my gun daily. But first, let me share with you the ways that I don’t believe most people should carry their gun. One way is using a shoulder holster. While they may look cool and are featured in plenty of Hollywood movies, they are not a good idea for most people. They are bulky and a lot of us are not walking around wearing the right type of garment to hide the gun. More importantly, if you’re not trained how to properly draw from a shoulder holster you end up muzzling (pointing the gun at) people who are around you, which is never a good idea. 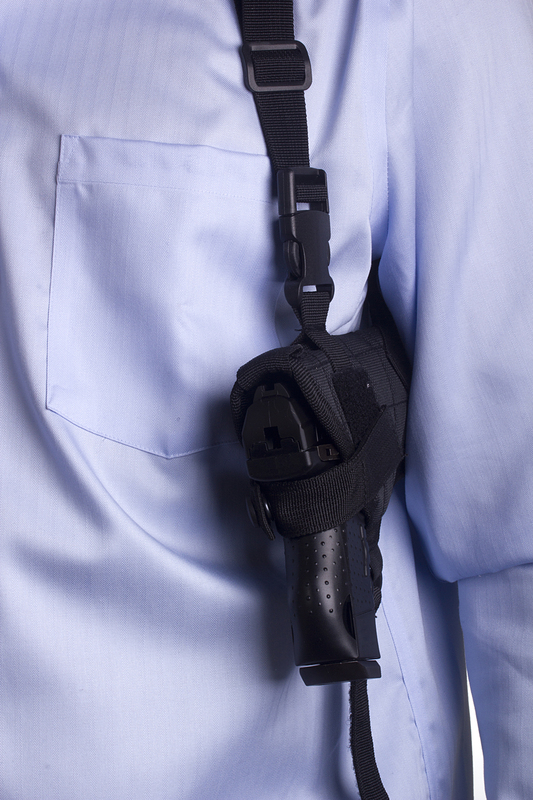 The only people I believe should use a shoulder holster are people who do a lot of driving such as truckers or executive protection specialists who are driving clients around all day. The reason for this is because from the seated position it’s easy to draw from the shoulder holster and get the gun pointed out the driver’s-side window at a potential threat. The next type of carry that I’m not a huge fan of is ankle carry. Again, the movies make this look cool but there’s a lot you need to know. First, carrying a gun on your ankle is not that comfortable. You’ll always notice it’s there and so you’ll definitely want a lightweight gun such as a Ruger LCP or Smith & Wesson snub-nosed revolver. However, the major problem is that ankle carry does not allow for super-quick draws. You have to bend down, pull up your pant leg, and draw the gun, which takes more time than some of the other positions I’m going to get to in a minute. I also don’t recommend appendix carry. It seems like appendix carry is becoming more popular every day, but I will personally never carry a gun that is pointed at my private parts or my femoral artery. Obviously, it’s horrible that a young man lost his life doing something as simple and ordinary as holstering a gun, but this is why you won’t see me carrying in the appendix position. What you will see me doing is carrying in one of my three favorite ways: in the pocket, inside the waistband, and using a bellyband. I carry my Ruger LCP and my Sig Sauer P238 in the pocket. 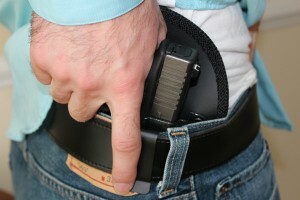 I like pocket carry because it’s comfortable, I can quickly access the gun and have a round off in two-seconds or less. 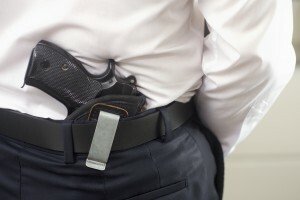 When I carry my Springfield 1911, Glock 19 or Sig Sauer P226, I carry inside the waistband at the 4 o’clock position so the gun is just behind my hip. This allows me to better conceal the gun and I can still get a fast draw in my preferred two-second or less timeframe. Milt Sparks makes some great leather holsters for inside the waistband carry as does CrossBreed. 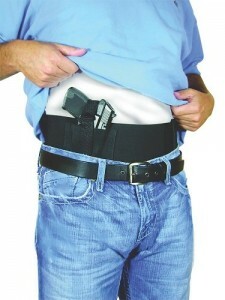 My third favorite way to carry a gun is using a bellyband. When I go running in the morning or do any type of exercising I always use the bellyband. It’s comfortable and allows me to easily carry my Ruger LCP or Sig Sauer P238. Even when I’m sprinting at full speed the gun stays secure and I’ve never had one fall out. I do know some folks who carry larger guns in their bellyband, such as a Glock 19, so if you prefer a full size gun, that can also be done. If you go to Amazon and do a search for “bellybands” you’ll see plenty of choices and can find one that works for you. The bottom line is, there are a lot of decisions that come with being a gun owner and some of the most important are where you carry the gun and in what kind of holster. So, if you haven’t found a way that works for you yet, give the three ways above a try and you’ll hopefully find a solution soon. From Michael W: I tried and tried to break through the duct tape wrapped around my wrist and I couldn’t. Then I tried your method and voila! Easier than I thought. Then my 110-lb wife (who has serious strength problems in both her arms) was able to break through the duct tape easily the first time! This really could be a lifesaver. Thanks for sharing it. A: You are certainly welcome. Once you know the technique it’s incredibly easy to escape duct tape and it doesn’t matter how strong you are. From Elaina D: What is your age range for the Spy Escape & Evasion course? I’m 15 and I’m interested in this and it sounds cool and fun. From Lee A: Enjoyed the Sig article. At first I bought a Ruger LC9 and found it too uncomfortable for waistline carry. Then I got the Ruger LCP (.380 / HP) for pocket carry – and that works fine – BUT the gun has NO safety. So I’m reluctant to have one in the chamber. I don’t know how size and weight compare to the Sig – but what do you think ? A: I think if you’re going to carry a gun you always need to have a round in the chamber. The time it takes to rack the round (if you remember to) could cost you your life. So, if you don’t want a gun without a safety then I would definitely recommend the Sig P238 since they’re very close in size and weight. From Marshall H: Hi Jason, I love your blogs but I’ve had two questions for a while The first one is about jiggler keys. I read here that you said jiggler keys are good for older cars but what about newer cars? I know about slim jims, pull rods, the string method etc. but will they work on newer cars? What do you consider newer cars? I was also wondering how you like to carry your knife and tactical pen for quick access. Thanks. A: Jiggler keys will not work on cars made after the year 2000 because of electronic locks and sophisticated computer systems. Also, I carry my knife clipped to my left pants pocket and my Tactical Pen clipped to my right pants pocket for quick and easy access. From George B: How can I upgrade my Gold account to Titanium and get the one million in legal protection? A: As you mentioned, Titanium Alliance Members get $1 million worth of legal coverage if they ever have to use a firearm to defend themselves. You can upgrade your account by going to www.AllianceLiberty.com or by clicking here. Just choose the Titanium Membership choice and this will automatically replace your Gold Membership. If you have any questions, you can also call Lisa at 801-512-2545. Are You a Victim of This IRS Scam? Jason. Your RFID 2 card pack, is the correct use one card on each side of a wallet. Or one card for one wallet?? You only need one card in your wallet. The RFID card protects all the cards around it.